Conspiracy theories have always been around, but lately, they’ve been getting more attention. As the prevalence of conspiracy thinking among the electorate and even within the highest offices of government has become clear, conspiracism has inspired popular think-pieces and attracted scholars. Along the way, conspiracy theories have also inspired plenty of myths. Here are five. Myth No. 1: Conspiracy theories are for the lunatic fringe. Presenting fringe theories as the essence of conspiracism gives the impression that conspiracy theorists are a handful of kooks who will believe even the most ludicrous ideas. But conspiracy thinking - the inclination to entertain conspiracy theories in general - is much more widespread than belief in any particular theory. The conspiracies that elicit smirks aren’t popular: In a 2013 poll, 4 percent of American voters said they agreed that lizard people control politics, and in a 2018 poll, 7 percent of U.S. adults said the Earth might not be round. For comparison, Bigfoot had around twice the fan base in several surveys. Other theories, though, attract much larger followings. More than half of Americans said they believed at least one of the conspiracy theories they were asked about in surveys between 2006 and 2011, blaming the Iraq War on oil companies or the 9/11 attacks on U.S. government insiders, for example. A recent survey found the same proportion of conspiracy theorists among the British public. Even these figures are necessarily lowball estimates, since the surveys ask about only a handful of theories. It’s safe to say that most of us are potential conspiracy theorists. Myth No. 2: Conspiracy theories are more common than ever. “Are we entering a golden age of the conspiracy theory?” asked a 2017 headline in the Guardian. “Conspiracy theories are more rampant than ever,” asserted another in August 2018. The Internet — and social media in particular — is often blamed for fueling the fashion for conspiracism. But there’s no good evidence that conspiracy theories are more popular than they used to be. It’s long been fashionable to claim that the current moment is the age of conspiracy theories: Thirtyyears ago, scholars asserted that previous generations “only dabbled in conspiracy like amateurs” but that the conspiracy theorists of their own time had gone pro. In the most thorough study to date, researchers combed through more than 100,000 letters to the editor published in the New York Times and the Chicago Tribune between 1890 and 2010. They found a stable background hum of conspiracy theorizing, not an ever-increasing cacophony. This fits with the historical record: Conspiracy theories didn’t suddenly flourish in the 21st century, or even the 20th. They’ve always been with us, and people have spread them through whatever technology was available. Ancient Athenians performed plays espousing plots about every aspect of their lives; 19th-century anti-vaccinationists printed posters. The Internet is a useful tool for indulging in conspiracy theories, but it doesn’t seem to make people more inclined to go in for conspiracy theories in the first place. Myth No. 3: Conspiracy theories are all in people’s minds. Psychological findings do help explain why people believe or dismiss conspiracy theories. But focusing exclusively on unconscious biases and cognitive mistakes overlooks the fact that there is often a kernel of believability at the heart of these theories. Governments and organizations do things in secret. Intelligence agencies plan assassinations and coups, spy on people, try to manipulate public opinion. Even if you're pretty sure the government didn't develop HIV as a bioweapon to be deployed against unsuspecting citizens, for example, to suggest that government researchers might conduct secretive, unethical experiments involving the health and autonomy of marginalized people isn't crazy; it's history. In a clever twist on the usual survey, psychologist Mike Wood once asked participants about typical unsubstantiated conspiracy theories, but also whether they believed claims involving government bribery, mind-control experiments and efforts to influence the media (without mentioning that these conspiracies were historical fact). People who dismissed the conspiracy theories tended also to dismiss the real conspiracies. Which is not to say that all conspiracy theories should be embraced, of course. But neither should conspiracy thinking be written off as a mere psychological flaw. Myth No. 4: Conspiracy theories are an existential threat to society. In the first few days of August 2018, mainstream news headlines described an emerging conspiracy theory as “bizarre,” “dangerous,” “terrifying ” and a “deranged conspiracy cult.” The movement, one Post columnist wrote, “is scary because it’s getting bigger, it’s scary because we don’t know how to stop it, and it’s scary because the people behind it won’t be stopped.” Yikes. The catastrophizing headlines were part of a broader tendency to paint conspiracism as a creeping contagion that “manages to insinuate itself in the most alert and intelligent minds,” as historian Daniel Pipes charitably put it, or as “mumbo jumbo” that has already “conquered the world,” as journalist Francis Wheen bluntly asserted. 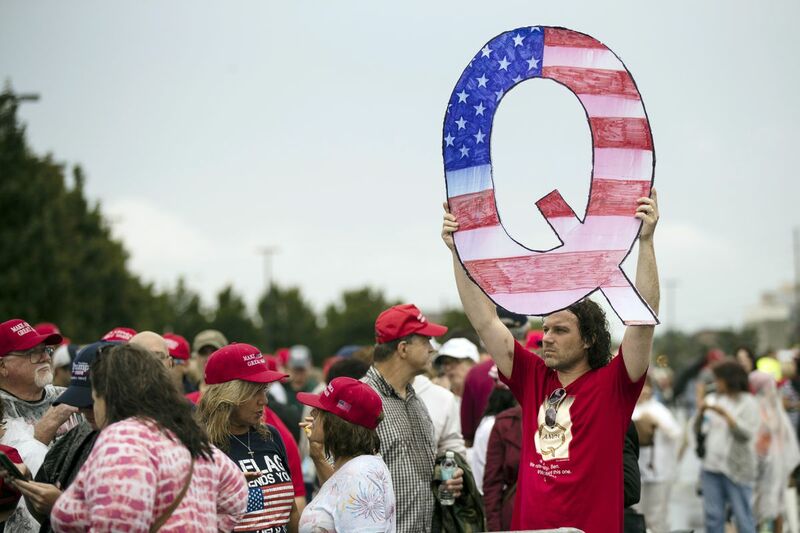 Those articles last summer were about QAnon, a loose collection of cryptic nonsense that started online and manifested as a handful of people showing up at President Trump’s rallies with homemade signs and shirts. Though the articles implied a substantial number of believers, none reported any data. Subsequent polling showed that many people — 4 in 10 — hadn’t heard of QAnon or didn’t know enough to have an opinion. Among those who knew about it, it was viewed overwhelmingly unfavorably (by both Democrats and Republicans). An analysis of the QAnon subreddit showed that a tiny but vocal contingent of boosters was making almost all the noise about it on the forum. Most people who engage with ideas like this just sit back and watch, probably treating the theories as a curiosity or entertainment. Of course, ideas can have consequences. Timothy McVeigh , the Oklahoma City bomber, saw himself as resisting a government conspiracy to grab the citizenry’s guns; a man who believed in Pizzagate, a conspiracy theory about a D.C. pizzeria, fired a gun in the restaurant and terrorized its patrons, who included children. But these men are the exception, not the rule. Hyping up every conspiracy theory into an existential threat without any evidence is, ironically, the same habit of mind that produces conspiracy theories in the first place. Myth No. 5: Facts don’t change people’s minds about conspiracy theories. In a 2010study, people first read misleading claims and were then given corrections to those claims. Reading the corrections appeared largely ineffective and actually increased mistaken beliefs among the people who had believed the incorrect claims most strongly to begin with. Recently, however, research has called the backfire effect into question. In 2017, researchers ran a series of studies in which more than 10,000 participants encountered 52 different claims and corrections. That work found no backfire effect, concluding that by and large, “citizens heed factual information” — even when it goes against what they are inclined to believe. Other studies likewise find that fact-checking and pointing out logical inconsistencies can reduce belief in conspiracy theories. Correcting misconceptions won’t persuade everyone to give up on every conspiracy theory, of course. But it appears to be no worse - and often better - than nothing.